We are deal in Round Cutting Burr. 2. Well for single cut, double cut. Our broad range of TC burrs with 3 mm shank dia. has been further expanded. These PFERD tools are now available in 75 mm shank length versions for problem solving in hard-to-reach areas. Our existing sets are supplied in a new, highly resistant plastic packaging. Each burr is firmly secured and protected in the new pack. 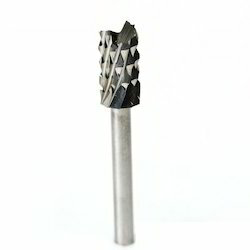 The Burr Cutters that we offer likes our clients because of the accurate dimension. This offered array is developed in different sizes with high-quality basic materials. Before final delivery, a team of quality examiners checks this all offered array on varied parameters of quality, to ensure that product is free from flaws. - The handle can hold both types of blades rotating and fixed. 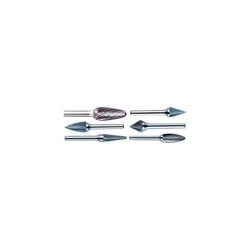 - The set includes best moveable/popular blades. Set includes Rapid burr RB1000 and modified D50 Mini Scraper Blade. Extremely high cutting rate and long life, can be reground repeatedly. Professional chip removal and excellent finish with the special standard cross N cut or NK double-cut diamond tooth pattern. Smooth running, especially with drive tools running with precision bearings. In this two or more single point cutting tools arranged together as a unit. The rate of machining is more & surface finish is also better in this case. We are leading importer and distributor of Round Burr in Jaipur, Rajasthan(India).